Station Hollywood: Talat Mehmood - the man with velvette voice was remembered on death anniversary. 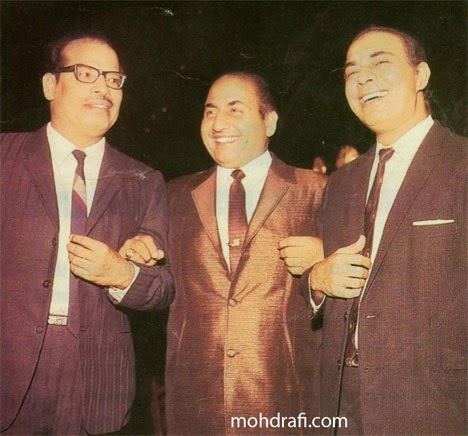 Talat Mehmood - the man with velvette voice was remembered on death anniversary.
. He was a leading performer in bollywood films during the 40s, 50s and 60s. Along with Rafi, Mukesh and other leading singers of bollywood Talat Mehmood sang notable songs in the films of leading stars of bollywood. He rendered his voice for most of the actors of the bollywood during the 40s and 50s including Dilip Kumar, Raj Kapoor, Bharat Bhushan, and others. His landmark songs included “dil-e-nadan tujhe hua kya hai” composed by Ghulam Mohammad and picturised on Bharat Bhushan, in the film Mirza Ghalib in 1954, “koi nahi mera” composed by Shankar Jaikishan and picturised on Dilip Kumar in the film Daag in 1952, “mai dil hoon ek armaan bhara” picturised on Raj Kapoor in the film Anhonee in 1952, etc. He sang landmark songs for Dilip Kumar also in the films Footpath, Devdas, etc. All the leading composers of bollywood films of that age namely Naushad Ali, Shankar Jaikishan, Roshan Lal Nagrath, Madanmohan Kohli , OP Nayyar, Salil Choudhury, SD Burman and others used him in different films. 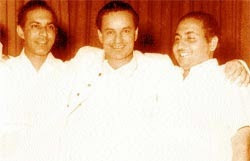 His other landmark songs included “phir wohi sham” composed by Madanmohan and picturised on Bharat Bhushan in the film Jahan-ara released in 1964. Talat Mehmood acted in a number of films including Dil-e-Nadan opposite Shyama, Raftaar opposite Nadira, Waris opposite Suraiya, Ek Gaon Ki Kahani opposite Mala Sinha and also showed his acting talent in those films. He had been mainly associated with ghazals and soft romantic songs. His vibrating technique in rendition had charmed many listeners of the golden age. He also sang light songs for many composers. His other songs included “jalte hai jiske liye” composed by SD Burman in the film Sujata, “humse aya na gaya” composed by Madanmohan in the film Dekh Kabira Roya, “itna na mujhse tu pyar bara” composed by Salil Choudhury in the film Chaya, “aye mere dil kahin aur chal” composed by Shankar Jaikishan in the film Daag, to name a few.. Talat Mehmood had a number of basic discs in Bengali as well. His landmark songs included “chander eto alo” and “alote chayate” composed by Robin Chatterjee, “duti paakhi duti teere” composed by Kamal Dasgupta, etc. The sweetness of his voice was well appreciated by the Bengali listeners as well. His songs and films should be preserved and restored.